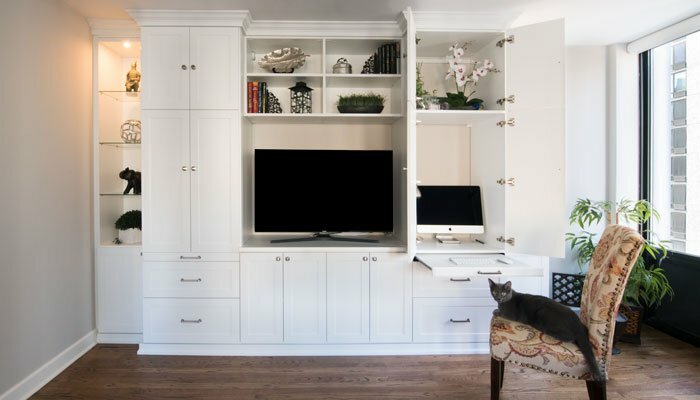 The goal of this project was to design a single piece that would offer an array of storage solutions, serve as the home's main entertainment area, and also provide a functional office/work space. Additionally, this piece needed to present a beautiful design and focal point for the client's living room. The resulting structure emanates harmony and balance. Varying textures, lighting, and sizes of compartments all unite in creating the perfect balance between form and function. The bright white laminate of this media center reflects light from a nearby window, creating a zen-like atmosphere. Transitional style was used to blend with the client's existing decor. Lacking a separate home office, this customer requested a workspace be integrated into the media center. 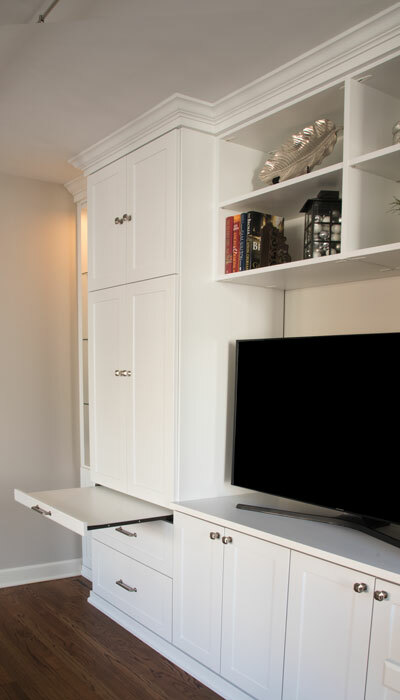 The simple transformation from entertainment center to home office is made possible by simply by pulling up a chair and opening a cabinet. The spacious compartment welcomes a large desktop computer with a convenient pull-out shelf for a keyboard. When not in use, the pull-out shelf/desktop recedes effortlessly into the wall unit, blending with the other drawers and cabinets. 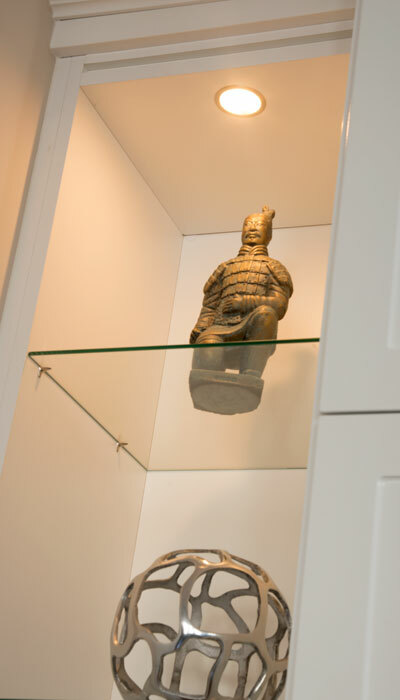 In its role as home office, the unit also provides safekeeping for important files. 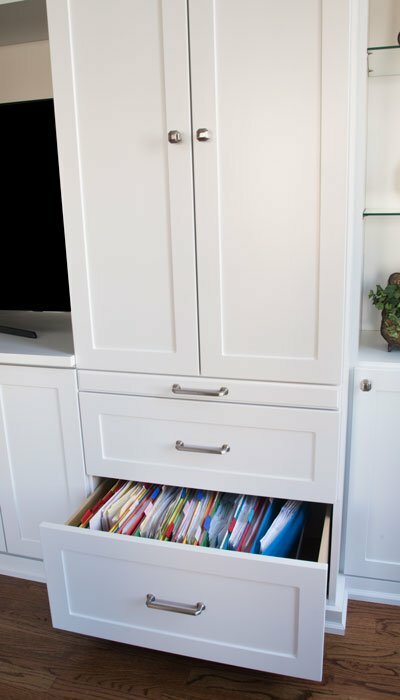 A large drawer equipped with a file folder organizer enables easy, but hidden, accessibility for important paperwork. The details of this media center are what really makes it a stand out piece. 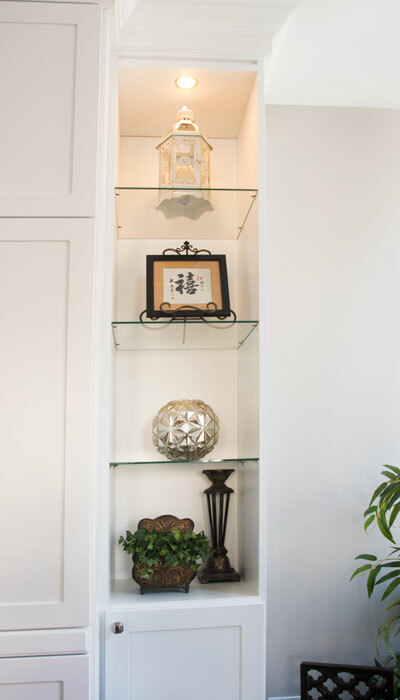 Highlighted by warm LED puck lights, the floating glass shelves add elegance and a hint of opulence. 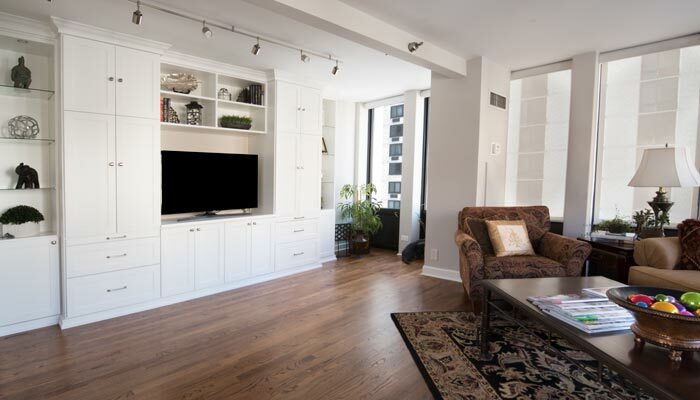 Another feature of this wall unit is the dowelled double door front. 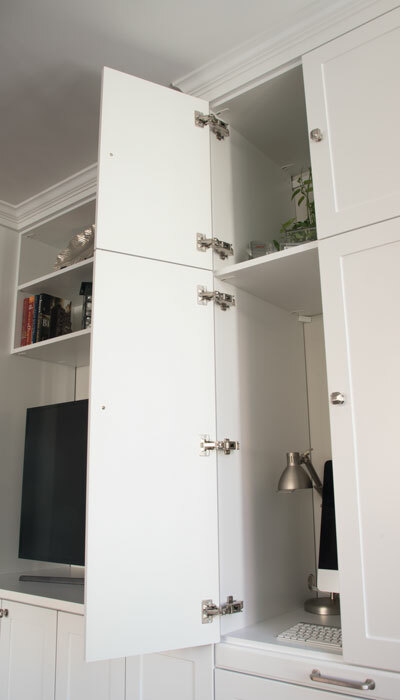 Built to resemble two separate compartments, the double door functions as one large single door. 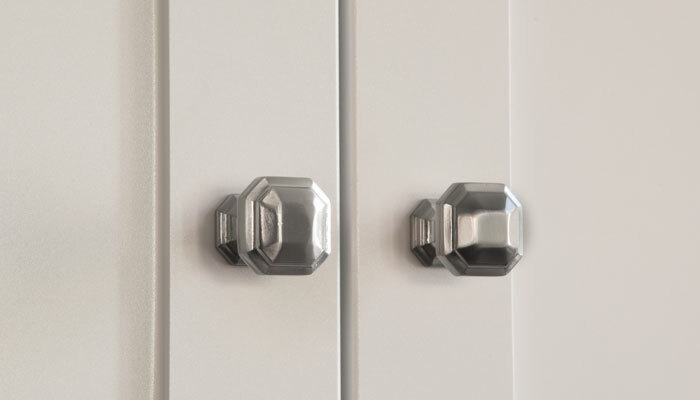 This creates symmetry and a delicate balance of shapes on both sides of the unit, while breaking up the otherwise massive look of the cabinet doors. 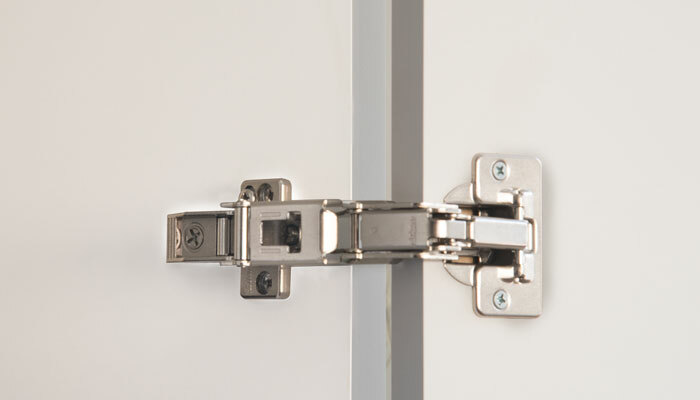 A 180 degree hinge binds the door to assure that it is completely out of the way when working at the computer. 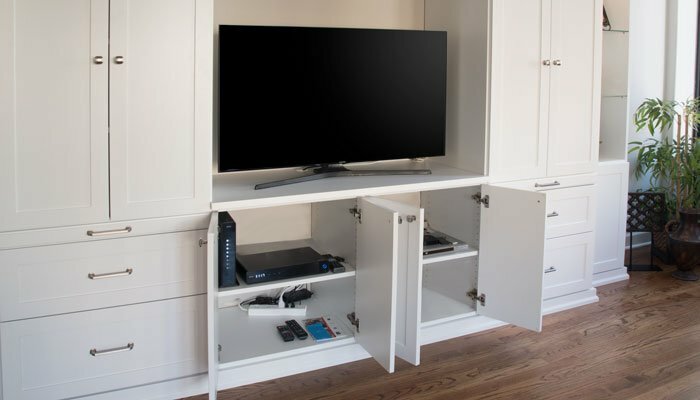 The cabinets below the television are designed to hide all media equipment. Wires are coralled into a single hidden grommett behind the TV. The benefit to purchasing a custom unit rather than a stock piece of furniture is that you get everything you can dream up in a small space. 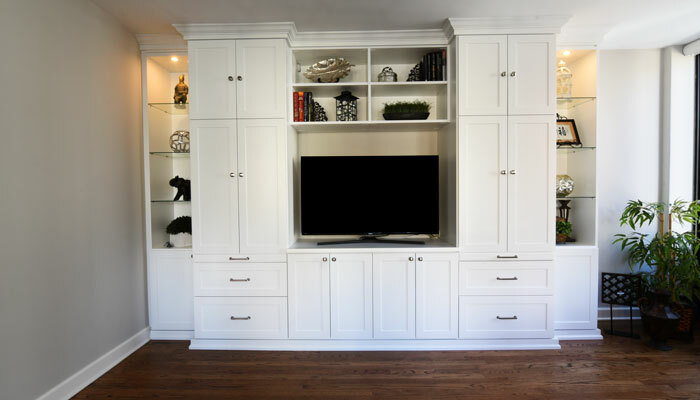 This homeowner now has two rooms in one by adding two pull-out desks to the wall unit.